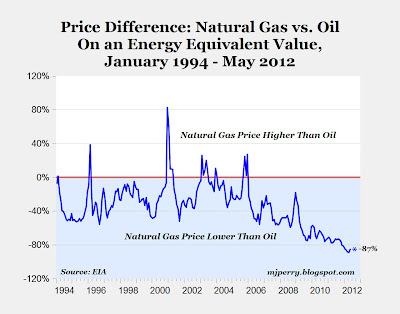 On an energy-equivalent basis, natural gas remains 87% cheaper than oil, equivalent to a price of $14 per barrel. "Shale extraction... is pushing down energy prices and creating many new opportunities for jobs, investments and manufacturing. And the new innovations are unique to the United Sates. Although other countries will exploit shale, none will come close to the low costs in the U.S. That's because the U.S. has a unique governmental structure in which many powers remain with the states, along with a very competitive market for the product, as opposed to the monopolies and oligopolies that control the market in almost every other country. While it may sound like the latest energy fad, the shale boom is for real and a serious game changer because of its size and potential longevity. 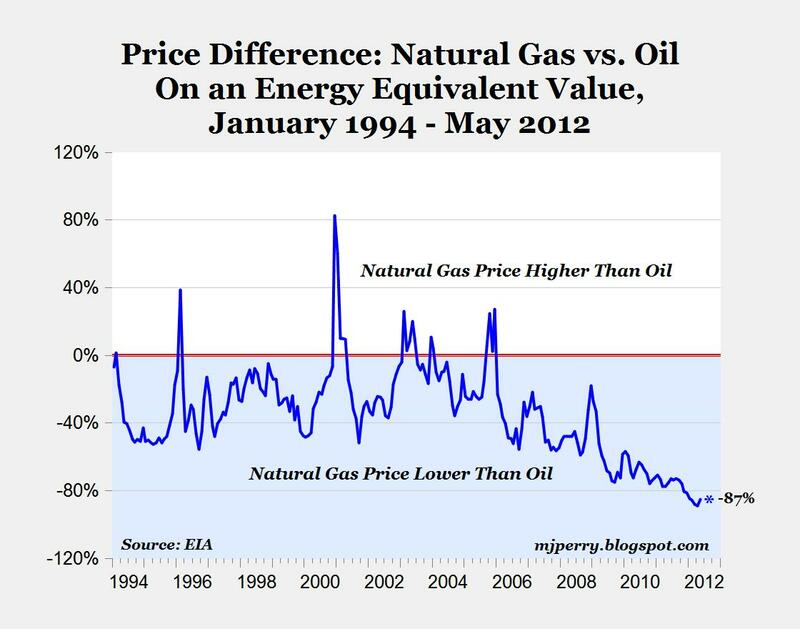 Based on equivalent amounts of energy, natural gas has been about half as expensive as oil for many years (MP: See chart above, gas has actually been closer to 80% less expensive since the use of fracking increased significantly in 2008-2009). Cheap gas may not be enough to offset the drag of a slowing global economy this year, but it will boost long-term investment, help the beleaguered manufacturing sector and increase exports. Building petrochemical plants could suddenly become attractive in the United States. Manufacturers will "reshore" production to take advantage of low natural gas and electricity prices. Energy costs will be lower for a long time, giving a competitive advantage to companies that invest in America, and also helping American consumers who get hit hard when energy prices spike. After years of bad economic news, the natural gas windfall is very good news. Let's make the most of it." It still remains to be seen how much natural gas will be able to hlp reduce the amount of imported petroleum used for tranportation. Undoubtedly, electricity will be cheaper, and some home heating, but beyond that, there is serious infrastructure work to be done. 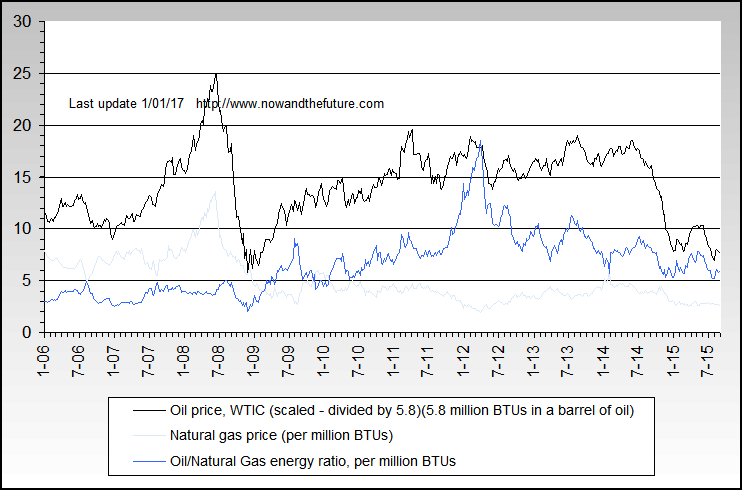 So natural gas has been "cheap" for 4 years. So I should focus on investment in industrial equipment and other equipment, being Table 5.3.6 in the NIPAs. It's been a bust for the last 2 quarters. I'm still waiting for that boom in manufacturing fixed investment. How much longer do I have to wait before show me the lack of the money trumps plenty of rhetoric? I'm still waiting for that boom in manufacturing fixed investment. Yeah, and you'll wait until Obama's driven out of office. Natural gas provides opportunities for investment, but it ain't a miracle. I have to agree with you, Hydra. Actually, switching cars and trucks over the CNG is not that hard. The infrastructure is largely in place already---the hundreds of thousands of gasoline stations. They make ideal locations for CNG. Or LPG (both used widely in Thailand and other nations). There is a guy in Oklahoma, cngvehicles.net, selling used CNG trucks off the lot right now for $15k or less. But explain to me why we still subsidize corn growers and mandate ethanol use? Why are these GOP favorites? Invest in naturhal gas storage. Obama will be around for four more years. Benjamin: when was the last time you took the glass tank out of yyour car and replhaced it with a pressure tank three times as large? Then all you have to do is run piping, chhange the injectors juandos reprogram the computer. Energy equivalence is only part of the cost measure. Over the past six months, The New York Times reviewed thousands of pages of documents related to shale gas, including hundreds of industry e-mails, internal agency documents and reports by analysts. A selection of these documents is included here; names and identifying information have been redacted to protect the confidentiality of sources, many of whom were not authorized by their employers to communicate with The Times.